im pleased to announce that i am now working on a new print & pattern book - this time with a paticular theme : childrens design. 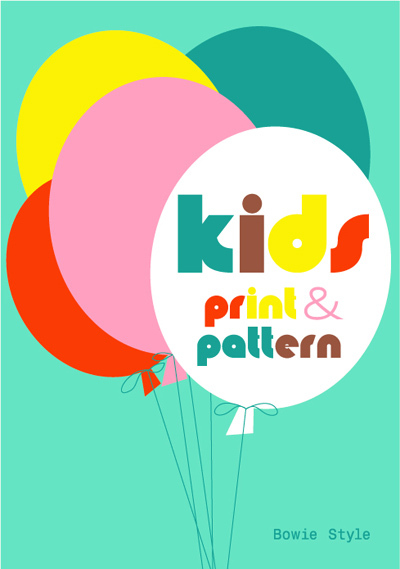 "print & pattern kids" will be a celebration of beautiful design created with little people in mind. this could include patterns, wall art, fabrics, wallpaper, greetings cards, wrapping paper, bedding, clothing and placement prints, illustrations, in fact anything aimed at the kids/baby market. (much of which of course also appeals to adults!). if you would like a chance to be included in the book then you can submit your entries between now and march 15th. all you need to do is send me between 5 and 10 low res jpegs of the designs that you'd like to enter and if possible a link to your website. just email your images and website link to : printandpatternbook@hotmail.co.uk and if you are successful i'll be in touch. if you have any questions or queries leave a comment below and i'll do my best to answer. som many lovely prints & patterns in here! Hi, sounds great! I have couple of questions: what do you think about photos of products, with the permission of the company who has bought the patterns? Or should all images be of unsold patterns that have not been seen yet in public? Also, when is the book due out? Thanks. Wonderful, I'll have a go too! Thanks so much for keeping us informed. Oh forgot to ask, do you have any specifications for submission (re: size, format, etc)? Thanks! hi leslie, for the initial selection stage low res jpegs are fine. then if the images are selected to go into the book we ask for either illustrator or photoshop files, 300dpi jepgs or 300dpi tiffs. ideally the image needs to be 300dpi when at the size of the book page (approx 240 x 170mm). not sure of the release date just yet. it depends on how quickly things works out. yes product photos are great if they are nicely styled or on white backgrounds. and its ok if the product/pattern has already been sold but you must have permission from the client you sold it to. all designers selected will need to sign a legal form saying they have the right to allow us to put their work in the book. Can't wait to see the final product - I love both of your other books! I'll defiantly submit, what a great idea! can't wait to buy this!!! Great idea to a kids’ book. I would love to be included and will definitely be in touch! I think this is a lovely idea, thank you for giving the new ones an oppertunity. GREAT! A question do you need at least 5 images or is 1 enough. haa perfect esp since I am having my art prints on Zulily this monday- which are mostly all kids prints!! for a fabric print we might like to see a repeat if we are covering a whole page. but for pages where there may be two or three images then just the tile is fine. sorry but we will need more than one image. each designer will have a least a double page spread to themeselves so one lone image will not suffice. I do both textile design and lino printing, I was wondering if entries need to be focused on one type of surface design or can images of both be submitted? hi alice, as long as the design is for children or babies then it will be considered. the book will be arranged by designer rather than by subject so it doesnt matter if the designer uses different mediums. I'm so happy I stumbled upon this. This is a fabulous idea! I will definitely be submitting some designs! Can't wait for this book to come out! This sounds like fun! I bought two of your books so far..I would love to be featured in this one! :) I'll give a try! We've sent an email to you with our creations, we hope you have received it! We discovered your books that we find really pretty! This book sounds so exciting, I have your other two and love them to pieces. I am a final year textile design student at Leeds University and my final project is based around prints for children. Would you accept entries from students? Hello! I am sooo excited to submit my designs!! Just a question on regard the deadline, is the 15th UK time? Thanks and looking forward for this fantastic opportunity! hi rosa - yes i was thinking the 15th at GMT time. but if you submit and it arrives on the 16th due to overseas times then thats ok. i just need to have a cut off point to actually make the final selection. I just wanted to double check the cut off point please. What is the actual time of the deadline - 2359 on 14th, or 2359 on 15th? Or end of working day 15th? hi dufflecoat - i really havent been that strict about it as to do an exact actual cut off time. its just that i need to have a date on which to know that i now have all the entries in and can make the final selections. so i would say entries should be with me by the morning of march 16th (uk time) to stand the best chance. so to put an actual time on it - 10am(GMT) on the 16th march when i'll be checking through emails. Just want to make sure you've received my submission, due to email setup problems on my end. It would be from Kayajoy designs, sent yesterday afternoon. Thanks! it depends what name you sent it under - nothing under the name vampire jaku has come through. there were 25 entries in last night and i've just being going through them all and i found your submission ! Oh oh, almost out of time ... quick question, does it have to be only repeats/patterns, or can it be any kind of design for children, say posters for kid's rooms? another request to ask if you've received our entry email. we sent from a popped gmail account we have yet to send an attachment from, hence our uncertainty. if it's not too much trouble confirmation would be super appreciated. no its not just repeats - placement prints and posters are most welcome. Hi bowie style!! I am so excited about this and would LOVE to submit my work. Am still finishing the last piece. Am I still in time? Can I get it to you by this evening please? Hi, the brief says 5-10 lo res jpegs of designs, could this be 5-10 design sheets featuring multiple designs or just 5-10 single designs? last minute jitters! doramay - tonight is fine. submissions offically close at 12midnight uk time. multiple sheets are ok as long as they are still low res. just to clarify - i dont really want multiple images. but justine complicated things and i didnt want to say no to her or to you. but to be honest i can tell from just 10 designs what an artists style is like. and if people include a web link then i can always look up more work if i need it. artists will only have room for around 4 designs on their spread anyway. That's fine - thanks for letting me know. Will leave things as they are! :)Thank you. Sorry to be a pain as I'm sure you have a tonne of emails to go through - I submitted some images last night but my web mail server has been going under maintenance so I'm not sure if it actually sent... I didn't want to re-send it and bombard you in case you did get it in the first place. If you could let me know if you got it and I'll re-send it if not. gingerbred sarah- yes all images recieved. Just submitted my work. Hope it's not too late. Could you please let me know if you received them? still a few hours left yet. I too wanted to make sure mine went thru last night? My email is oneplumspot...Thank you so much! Just wanted to check you received mine ok - duffy@hotmail.co.uk sent late last night. Just wanted to check if you have receive my message and the images ok.
HI Bowie Style – I sent an email applying for this competition on the 14th - however, I just realised that you ask for jpegs, and I sent a pdf. Is a pdf okay, or are you only accepting pdf applications? hi sian, dont worry its ok. i will still check out your pdfs : ) i asked for jpegs as i dont really like PDFS. jpegs are easier for me to open and save when it comes to making the selections. I sent an email on my name (patriciabomeny) with the prints of my collective - caju collective - to your kids book. I just want to confirm if you received the email and the images ok.
Hello Bowie Style. Having read all the other enquiries was actually wondering if you received my submission (Doramay Collection) late last Thursday. I'd be very grateful for a confirmation. Hello, only just discovered this! Are you still taking submissions? no sorry submissions are now closed and im in the selection process right now. This is so exciting!! I must check my design archives and submit! I saw this post on Pinterest and just realized this posting was from early this year :( Please let me know if you need more material as I just created a folder of designs for this. pls let me know if you need more materials. im really sorry but the P+P kids book is in the production stage now - we're just about ready for final proofing next month. but dont be disheartened as we may be doing more books afterwards. I will follow your blog and thanks for the reply.